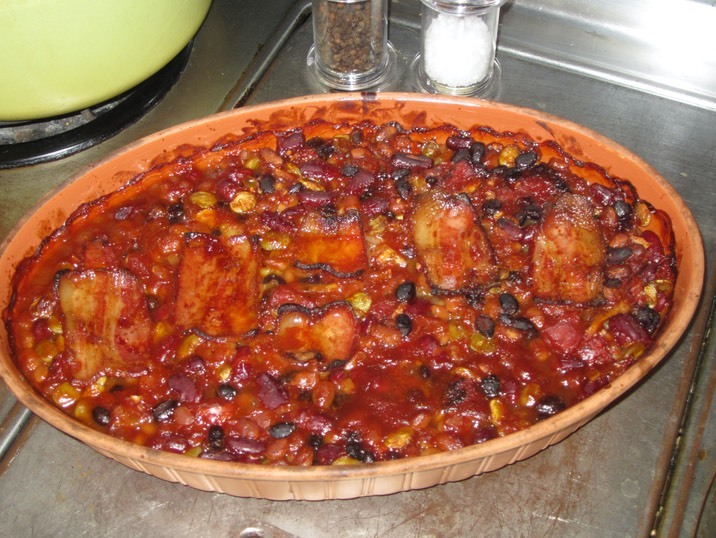 In a large casserole combine all ingredients except bacon. Top the filled casserole with bacon, cut to fit. Bake for 1 hour checking a couple of times. If beans are still a bit “wet” after 1 hour, bake another 20 minutes to half hour. *This is the original “no official recipe required” recipe. I like to add ground sirloin, change up the beans, and toss in a bit of bell pepper, depending on what’s available. That sliced hot dog is sounding pretty good right now. Don’t hesitate to play with your food!